New Delhi, July 21 (IANS) The CAG on Friday came down heavily on the Railways saying cleanliness and hygiene were not being maintained in catering units at stations and in trains and it was serving foodstuff unsuitable for human consumption. “During the inspection at select 74 stations and 80 trains, audit noticed that cleanliness and hygiene are not being maintained at catering units at stations and in trains,” the Comptroller and Auditor General of India said in a report tabled in Parliament. “Articles unsuitable for human consumption, contaminated foodstuff, recycled foodstuff, shelf life expired packaged and bottled items, unauthorised brands of water bottles are offered for sale on stations,” the CAG said. The report said unpurified water straight from the tap was used in preparation of beverages, waste bins were not found covered, not emptied regularly and not washed, foodstuff were not covered to protect them from flies, insects and dust, and rats and cockroaches were found in trains. 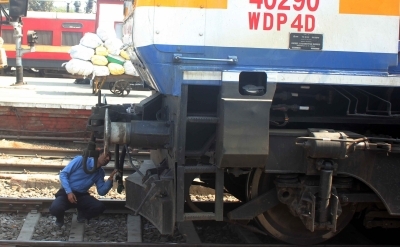 The CAG also pointed out that bills were not given for the food items served in mobile units in trains. It said that frequent changes in the catering policy and consequent transfer of responsibility to manage catering units had created a state of uncertainity in management of catering services provided to the passengers over the years. The CAG slammed the Railways over the use of gas burners in the pantry vans of trains instead of using electric power equipment. “The policy of progressive switchover from gas burners to electric power equipment in pantry cars to avoid the occurance of fire accidents in train was not followed while manufacturing the pantry cars in Integral Coach Factory Perambur. “A total of 103 pantry cars were manufactured by ICF during April 2011 to March 2016 with provision for centralised LPG cylinders and distributed to zonal railways,” the report said. The CAG highlighted that only 16 base kitchens were located inside the railway premises to control and monitor the food quality. “Over 115 base kitchens were located outside the railway stations and were not subjected to quality check,” the CAG added.